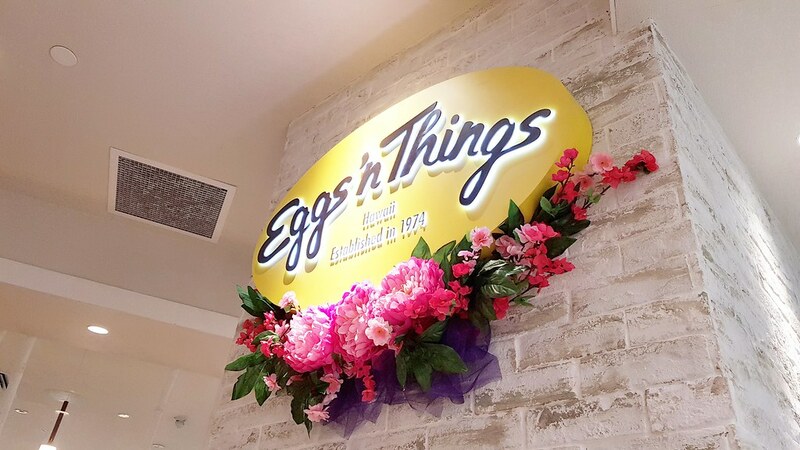 Making its debut outside of Haiwaii and Japan, Eggs 'n Things launches its flagship outlet at Plaza Singapura early last year. 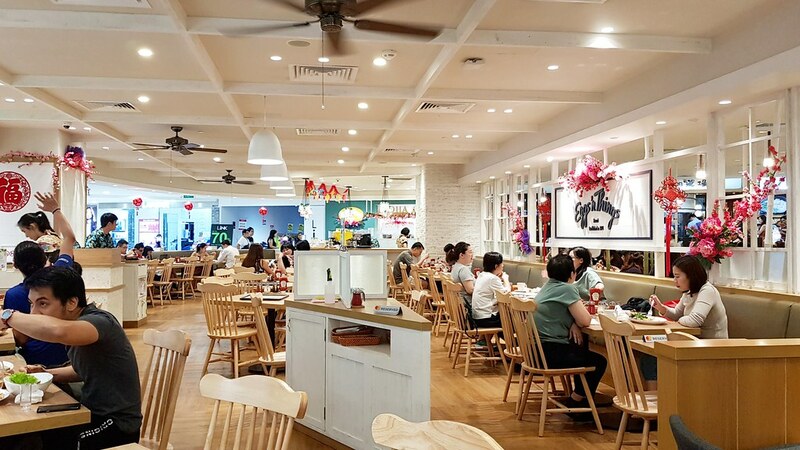 For this Lunar New Year, they have collaborated with Bee Cheng Hiang to roll out a series of delectable limited edition festive specials. 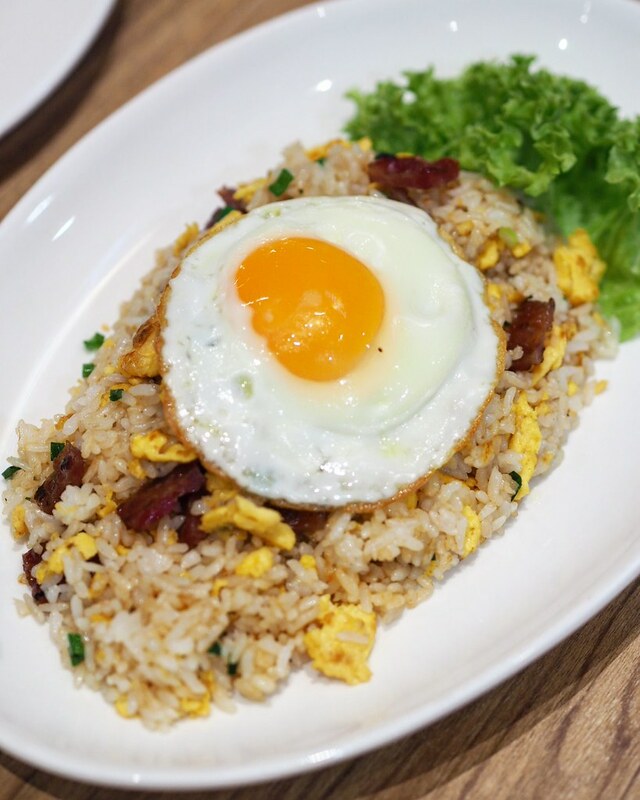 The first dish we had was the Bee Cheng Hiang Bak Kwa Garlic Fried Rice ($15.88) which comes in a plate of fragrant roasted garlic fried rice, mixed with generous bits of eggs and Bee Cheng Hiang bak kwa, before being topped with a sunny side up. Though I felt that the dish lacked the smoky wok hei, the copious amounts of egg and sweet bak kwa complemented the garlicky fried rice well. 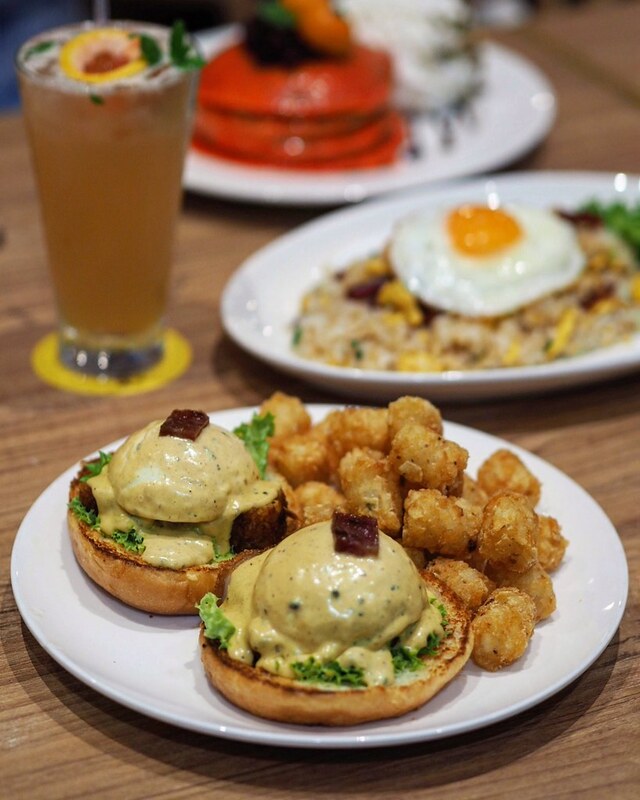 The Eggs Benedict with Crackling Roasted Pork Belly ($18.88) comes with a twist, substituting the usual brunch ingredient with roasted pork belly. 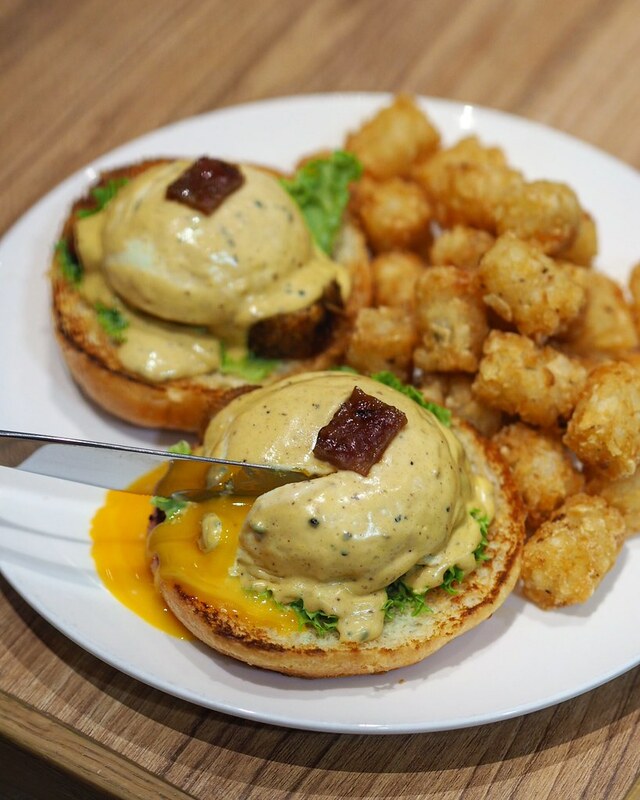 Perfectly poached eggs with their oozy molten cores, drenched in a creamy tangy mustard hollandaise sauce, my only gripe was the pork belly which was crispy yet tougher to chew with a slightly rubbery center. The tater tots cooked to a perfect crisp was a welcoming side. 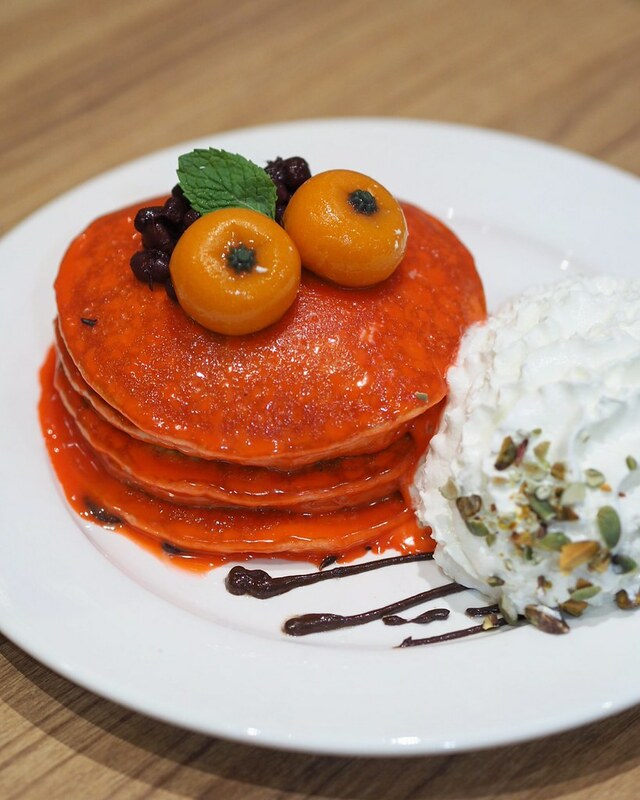 End the meal on a sweet note with the Azuki Mochi Pancakes with White Chocolate Ganache ($18.88) which features Eggs 'n Things signature pancakes with fresh chewy mochi. Extremely soft and fluffy, the crunchy nuts added to the pancakes contributed a nice textural contrast to the dish. It comes doused in a sweet white chocolate ganache before being topped with delicately sweet red beans and mandarin-shaped red bean paste mochi. However, it might get overwhelming after a while, so the dish is best shared among friends. The Honey Mint Grapefruit Green Tea ($6.88) is a refreshing and sweet green tea blend of tropical citrus, herbs and natural honey. These limited edition specials are available from 26 Jan – 28 Feb 2019, from Monday to Sunday (10am to 10pm). Prices listed above are exclusive of GST and service charge.